Welcome to my review of Issue 25 of Siren's Call Ezine which is celebrating Women in Horror Month. Inisde are some great stories not only celebrating the amazing talent of female writers in horror but the awesomness of women in general. You won't find crying damsels in distress but feisty characters to be reckoned with. It's gonna to get you. You know that. This is a tale that has it all; it's dark, atmospheric, moving chilling and menacing. Shadow Hands starts off with our protagonist Porter walking over a bridge plagued with the dark thoughts of his shadow. But is it his shadow? Or has he been driven mad with guilt of his macabre past? What is it that's going to get him? Retribution or salvation? Despite still studying at university in U.S.A Victoria Griffin has had many short stories published the most recent being in Flare, London Journal of Fiction, Five2one Magazine, Intrinsick Magazine, Black Heart Magazine and Synaesthesia Magazine. "Dark thoughts rippled through his mind as he dozed. A dazing blow to a pretty girl's temple flitted into view as a smile pursed his lips." A great little tale that explores what it must be like to be that fly-on-the-wall and how would you react to all the things you witnessed? Would you play the role of angel or demon? "He watched me with wide gray eyes, like he had scooped them from a cloudy sky behind him." A homeless girl is approached by a stranger offering her protcection from the oncoming storm. Grasping her golden ticket she sets off in search of the promise. A great darkly grisly tale of the hidden underworld. Hannah Cark hails from Nebraska U.S.A she mostly writes poems and this tale is her debut into the dark side, and a great debut it is. She has also recently been published in Demonic Visions #6. "The dark demonic faces welded on the rusted, ancient gates stare directly into my soul.They tell of the woes of those on the other side, and warn of my certain demise if I cross." Wilson embarks on a plan of rescue but in the process drives Alfred insane. This is a highly original tale full of powerful intrigue that keeps you guessing til the end. In the Evening Dusk is a beautifully atmospheric piece of flash fiction also known as a drabble, that speaks of a time long passed that comes into contact with the present. A chilling little tale about a figure that we've all heard of is he real or just a figment of everyone's imagination? In the end death comes for us all, but who comes for death? "He was the only dark spot in a cloud of whiteness." A powerful tale of the strength of a child's unwavering curiosity. Tilly has been left by her parents and is entirely alone except for the man sitting on a mountain of snow outside her house. She is deeply afraid of him but it's her needing to know that pervades. B.E.Seidl is from Vienna in Austria and also writes non-fiction she has been previously published in Flash Fiction Magazine, 101 Words and Tethered by Letters. "As she watched out the rear window of the car, the crumpled paper grew legs and began scurrying after the car." A dark surreal tale that creates fear from the ordinary. Emma, a young child spots a piece of paper following her as her mother drives her home. Emma is alarmed to find it waiting outside her house, but surely, it's just a harmless piece of paper? Winnona Vincent lives in Northern Calafornia and enjoys writing horror and fantasy. This isn't the first time her excellent fiction has appeared in Siren's Call, she's previously been published in Issue 24 - Lost Souls. "Go to your room. Lock your door. Get into bed and cover your head with your quilt. Sleep if you can and if you can't...well...there's nothing to be done for it. These things need doing. You will understand one day. I can't imagine that it will be long now..."
"What if I'm better off not knowing what wakes me up. No, I need to find out." Sometimes it's a niggling thought or anxiety that wakes us up at night, but what if it's something much worse? This great little tale leaves you feeling uncertain of the night realm. Has Daniella saved herself or plunged herself into mortal danger? C.Cooch hails from Devon, UK and has sucessfully turned her hobby of day dreaming into writing and is currently working on her first novel. Becoming is a short but most definitely not sweet tale of a young woman who is being hunted by someone she knows all too well. Emerian Rich hostess of HorrorAddicts.Net is the author of Knight's Night and Artistic Licence. She has also been previously published in the following anthologies; Dragon's Moon Press, Hidden Thoughts Press and White Wolf Press. What starts off as a picturesque scenario soon descends. A young mother, Claire, puts to bed her beautiful daughter and relaxes with a whisky and book. When she looks off her dogs have run off in fright and there's a strange light reaching into her house. We always associate light with being a force for good and the darkness a medium for all things evil but sometimes the light can be just as macabre. C.A.Viruet is an author who has previously been published in the Dark Chapter Press anthologies - Flashes of Darkness and 8 Deadly Kisses. "Mrs Smith draped with too many gold chains, and smothered with brooches and bracelets, quickly offered me the cheap room.She ushered me into the bed and breakfast. Desperation and the low rates equaled a reason to remain even though my instinct told me I should have got back in my car." Donna Cuttress is a writer from Liverpool UK, who has been previously in Crooked Cat, Firbolg Publishing, Solarwyrms 'Latchkey Tales' and Flame Tree Publishing's Chilling Ghost Stories. She has also featured before in Siren's Call Publications. "Only a child's mind, a mind as inviting as a blank canvas, could attract the uber demons who prey on our deepest fears." An eight year boy has a very sinister problem in this highly original tale; there's a monster in his cupboard waiting for the moment to tear him to shreds. He has to believe and remember if he is to survive. "At graveside's edge, her voice beguiles me, a siren's song that compels beyond all reason." A dark yet macabrely sweet tale of loss and new beginnings. H.R.Boldwood is a prize winning author and nominee for the Pushcart Prize. She has previously been published in Dead Reckoning published by Grey Wolfe Publishing. "Rachel studied Sam's body, silhouetted against the reddening sun as he worked the bolts. Beyond him lay the twisting driveway. His excitement infected her. "I've done it!" Sam pushed the gate open." Sam and Rachel embark on their own ghost hunting mission at Ladyswell Asylum for Rachel it's a small price to pay to be able to spend the night with the man of her dreams. It's the not the most conventional first date and in this delightfully dark and gothic tale Rachel soon discovers why it might not be the ideal setting for a blossoming romance. Carmilla Voiez is the author of the award winning trilogy Starblood and lives in Scotland with her family. "That handprint on your bathroom mirror was the hardest thing I've ever done. Focus. Concentrate. Press down and pull away." Predatory and brooding this is a gripping tale that pulses with tension. As you read read this you'll be asking yourself just one question; who or what is doing this? Great horror focuses expertly on our fear of the unknown as this tale does exactly that. Jessica Walsh is an author from the Midwest U.S.A and has been previously published with Dreamspinner Press. "Once you go to bed, do not leave your room." Lydia's grandfather, the last of her kin, has died leaving her his old dusty house which she must sort through. Most people would be thrilled to inherit property but this is no ordinary house...A gripping tale full of mystery and intrigue. Alice.J.Black is a writer from North East England and is the author of The Doors her debut novel. "The alarm would ring in another three hours and she needed to sleep." Maggie can't afford to lose her focus for tomorrow's meeting at work, all she needs is a good nights sleep. A really unsettling tale that chills to the bone. Renee L.Terence-McKinley lives in a haunted farmhouse with two demonic cats and her husband. A tiny tale that is both dark and funny. Debbie Manber Kupner is originally from London but now resides in St Louis and is the author of the fantasy series - P.A.W.S. "Show us something if you're not afraid." No damned way. Has to be my imagination. Dean slammed the door shut and stood wih his back pressed against." Dean's preparing for the gathering snow storm he thinks he's safe in his home but he's wrong the storm brings more than just snow. Morgan Songi has been writing her whole life and has been previously published in the U.S.A and Canada. "Eyes flicker then open. He stares up at the shapes that form and disperse in the fluid dark. He is like water or smoke, infusing the flesh, seeping into it, merging with muscle and bone." A man comes to during the night, he's just having a sleepwalk as he usually does but there's something deeply unsettling about this situation. This is a really well thought out chilling tale brimming with psychological terror. Magenta Nero is a prolific writer who has previously been published in previous Siren's Call ezines, Sanitarium Magazine, and in 15 anthologies from James Ward Kirk Fiction and J.Ellington Ashton Press. "The red eyes blinked again. 'I see you," the girl whispered, her breath leaving moist clouds on the glass. It was time to run again." Miss Mahindra a supply teacher has been called in to cover another teacher's absence and whilst doing so she encounters Lupita a strange and sullen child. She shows a remarkable ability in her spelling bee but that's not all that's remarkable about her; she harbours secrets. A great tale that blends togther horror and science fiction. Kenya Moss-Dyme is an award winning author of Prey for Me and The Good Wife. "Mistress chewed in silent contemplation for a few seconds. She preferred her meat rare, and the blood welled over her lips, which was then carefully wiped away with a snow white napkin." There's strange goings on at Mistress' Diner, a great macabre tale. Melody Luttrell is an author who lives with her spouse, roommate, ghost and two cats in Springfield U.S.A.
"A noise that sounded a little like a giggle eminated from deep within the folds of the cloak. 'Death is legion. We are many. We know all.' "
Unable to sleep Zoe steps out into her garden but she is not alone. Past events long forgotten resurface and she must finally face her past. A truly sinister tale of the darkest depths of the human condition. Betty Gabriel is an author from Devon in the UK who loves tea, curry, cider and rock music. She runs a small gift shop on the sea. "All Harvey Black wanted was a cold drink to wash down the dust. He pulled the big rig into Andre's Bar and climbed down the side of the cab. He knew better than to stop at Shadow Ridge, but he's just so freaking tired lately, and he couldn't seem to put his finger on why." Harvey Black first hears of the curse when he stops in a down and out bar on his way home. However he's more worried about his irate wife who's hot on his trail. A great unique tale with dark humour and of course horror! Kelli Honaker has been previously published in WV Writer, Prerogative, The Greenbrier Valley Quarterly, and Grandfather Hollow - a horror story collection. "Here, take this,"a man said startling her, making her twist around. Two men with platinum hair, their eyes hidden behind dark glasses with circular lenses, stood beside her. One of them was shoving a stapled packet of papers in her direction." Prompted by a disturbing dream Melinda is left perplexed by the Devonian and the white cat which featured in her dream. She suspects it was just a load of nonsense but is it? Rivka Jocobs is a writer from West Virginia who has been previously published in The Magazine of Fantasy and Science Fiction, Far Frontier Anthologies, Women of Darkness anthology, The Literacy Hatchett, Riding Light Review and in previous Siren's Call ezines. Clara, a forgotten orphan has a swift reversal in fortunes when she is adopted by an incredibly wealthy lady; Mrs Alexander. She can't wait to begin her new life. A quirky tale that soon descends into darkness. Suzi Lockhart has had over 35 short stories published, she is currently writing a YA novel. "I don't care if they're partying," Annie grumbled. "They had all this empty farmland out here for partying and or parking, why do they choose right in front of our house?" Tim and Annie are woken up by loud music playing otisde their house. Tim is elected to go and investigate who's making the noise. This tale has the feel of a modern day macabre fairy tale the end is delighfully ominous. Lori Safranek is the author of Freaked Out, a horror short collection and has previously been published in many anthologies. She lives in Nebraska with her husband and two dogs. "No good will come of this," said old Bojana, standing by the stream. "Aye,poor thing. Her soul is damned," answered her younger friends Cveta. Almost all the village was gathered now, on both sides of the river and on the little stone bridge over it. This excellent tale draws upon ancient superstitions and ghastly creatures from russian folklore. The writing is beautiful, haunting with a dreamlike quality. E.H.Qin is a writer who specialises in social commentary, romance and science fiction. "Gerrie Knots heard many tales about the Garmontsville Hotel throughout high school. It sat up on Wasp Hill. Many swore the grounds were haunted and whispered stories about what they'd witnessed." Gerrie Knots doesn't beleive that the Garmountsville Hotel is haunted and decides to spend the night there to show her best friend Hazel that the rumours are lies. But which friend is right and is it just ghost Gerrie should be scared of? 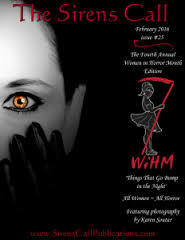 Miracle Austin is the author of Doll her debut paranormal novel and lives in Texas with her family. "Back then I was a lonely girl and so, I was delighted when you came into my life." A heartbroken woman looks back on her failed relationship but this is no run of the mill romance.A great tale that really pulls you in. Selena Kenworthy lives in Cheshire and spends her time writing short stories and novels and loves horror and speculative fiction. "Well, the Persistent Vegetative State crew is a quiet bunch," Evie said below her breath, an eyebrow raised." In a dark, edgy tale, Lynn has just started her night shift and there's a newcomer in room 201 someone who'll Lyn will never forget.